A powerful upper ridge and high pressure system dominate the Arctic region and N Europe, with a deep trough / cyclone over the N Atlantic. An upper low crosses the Alps and merges with a large upper low over the Mediterranean. ENH risk has been issued for S Iceland with threat for severe to extremely severe winds, locally in excess of 120 km/h. Higher gusts (above 150 km/h) are likely over the mountains. Additional risk will be an excessive orographic rainfall in SE Iceland, locally more than 100-120 mm is possible. ENH risk has been issued for parts of N Atlantic near the center of deep cyclone, peak gusts should exceed 130 km/h. SLGT risk has been issued for surrounding areas of ENH risks including W/S Iceland and N Atlantic for severe winds in excess of 100 km/h. ENH risk has been issued for SE Turkey into N Middle East with threat for severe storms, capable of producing severe winds, large hail and torrential rainfall. 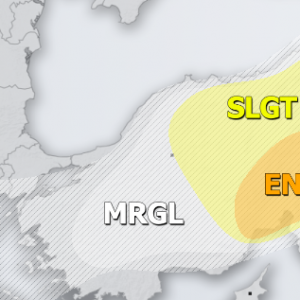 SLGT / MRGL risks have been issued for areas around the ENH risk across much of Turkey with more isolated threat for severe storms, capable of producing marginal hail and strong to severe winds. MRGL risk has been issued for N Georgia into SW Russia with threat for severe storms, capable of producing severe winds, large hail and torrential rainfall.